It is a case of biding your time, as you perceive matters moving along at a quick pace that is surprising in view of where you just a year ago. Whilst you had been hoping for the elusive announcement of Disclosure, other factors necessary to completion were also receiving a lot of attention from us. The result is that once we can get started, you will find yourselves on a bit of a roller coaster ride. However, it will be an enjoyable experience and carry you forward on a wave of joy. Life cannot go on much longer as it is now, but if enlightened you know what to expect, and it should keep you in high spirits. At a time when your memories of a most shocking day in your history have been revived, you will need to keep your sights on Ascension. Feelings will be felt again of the pain and sadness that resulted from it. It will stir up resentment again against those considered responsible, but there will be a balancing because of those who know the truth. In the time that has elapsed since 9/11 many have learnt that the truth bears little resemblance to the official line. That in turn can evoke anger at those who perpetrated such an evil deed against their own people. However, we would beseech you to allow destiny to look after the outcome, because no one gets away with any crime against Humanity. Look upon it with a degree of indifference but not because you do not care, but because you can take it in your stride. The Light is needed just as much at this time as ever it was. We have seen you tackle the dark Ones as we expected, as the Light cannot be held back for ever. It has grown in spite of attempts to create fear and many distractions. The army of Light has proved it is more than equal to the army of darkness. The plan for your spiritual enlightenment was made a long time ago, and the White Brotherhood made sure that many great Beings incarnated on Earth to create the Grid of Light. We are referring to all of you who have awakened to your tasks, and yet you may not realise what an important role you have played. Do not under rate yourselves, as you are part of a superb team that works quietly without seeking fame or publicity, and you are dearly loved by us all who are watching over you. 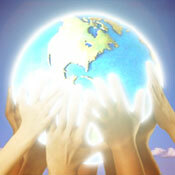 Recently Mother Earth has been relatively quiet, but that will change as the need for cleansing grows more urgent. We are fully aware of what to expect and we do co-operate with her. There is certainly not going to be the catastrophic events predicted by some quarters, and it is as well to bear in mind that many changes have been made to the end times. You can take some credit for them, as the levels of consciousness have risen considerably in recent times. Simply look upon the future as full of probabilities and expect the best outcome, and that way you will continue to add to the existing Light and have nothing to fear. As we so often ask of you, keep solidly focussed on the result of all the changes because they will lift you up very quickly, and deal first with the major ones that are keeping you back. In one way and another the lack of money has become the most disturbing factor, as it has repercussions for everyone. What governments are gong to learn, is that no matter what they do to restore the old system of finance it will not work. It has been collapsing for a long time and only propped up by printing more money, which is no lasting answer. Our allies have established a new structure that will ensure no repeat of the financial fiasco you are involved in. It will succeed, because it offers a secure way out before the problem becomes even more serious. I am SaLuSa from Sirius, and know that you are sensing the nearness of Ascension, and the path to happiness is opening up so that we can walk hand in hand with you, in Light and Love. Bless you all Dear Ones.